New Zealand face Australia at Westpac Stadium in Wellington on Saturday with nothing but pride at stake after their loss to South Africa handed the Tri-Nations title to the Springboks. The teams have met twice at Westpac Stadium, most recently when New Zealand snuck past the Wallabies with a 16-7 victory. The visitors will not need reminding of their other trip to Wellington however, as it produced one of their most famous victories of the modern era. 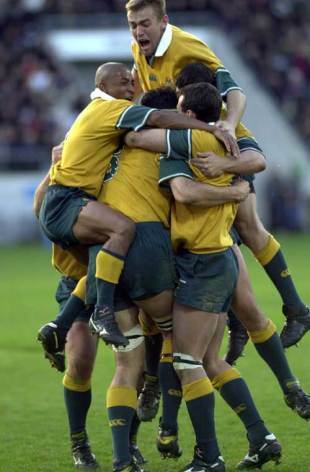 Legendary skipper and lock John Eales heaved over a last-gasp penalty to defeat the All Blacks 24-23 in 2000, wresting the initiative from their rivals in a classic Tri-Nations contest that ended with the world champion Wallabies lifting the silverware. At Wellington's old ground, Athletic Park, New Zealand's greatest success came in the final Test between the sides staged there. The All Blacks coasted to a 43-6 win, with Jonah Lomu, Jeff Wilson, Christian Cullen and Justin Marshall all getting on the scoresheet. The Wallabies' best result came a year before the Wallabies lifted the 1991 Rugby World Cup, when Phil Kearns and Michael Lynagh scored the points in a 21-9 victory. Most tries: NZ: 9 (38-13) at Dunedin, 1936; Aus: 5 (30-16) at Auckland, 1978 and (35-39) at Sydney, 2000.